I just heard back from Billie. They absolutely love your presentation – and time spent with you! She is confident the managers will use your material going forward, and felt they were all engaged in the morning. Thank you SO much for ALL you did for them. My bureau, Eagles Talent Connection, has had the opportunity to book Arnold for speaking engagements on multiple occasions. Arnold does an excellent job of listening to the client’s needs, tailoring his presentation and absolutely exceeding their expectations. I have received many spin-offs from his original appearances for our clients and these have resulted in additional bookings. He is a pleasure to work with and a great value. Thanks, Arnold!! Arnold – Thank you for yesterday! Our staff loved it and I’m anxious to turn the film into a promotional video to get the word out to our dealers and the state and metro associations. We’re excited to work with you and I know our dealers will benefit from your program.Thank you again for sharing it with us yesterday – it was a perfect kick off for our event and for the second half of our year! Great job Arnold! In addition to your terrific presentation, we really appreciated your exceptional efforts to get to know our audience. Your coming in early was a real stress reducer as well! We definitely look forward to working with you again. Elizabeth Bailey of 2b Communications was equally impressed and asked for your contact information to pass on to her non-profit clients. I heard nothing but compliments from our chapter leaders regarding your presentations in Phoenix and Atlanta. Well done! Arnold , Just wanted to say a quick thank you for presenting to our team on Tuesday night. Everyone was still talking about it the next morning. You did a fabulous job engaging everyone and keeping the presentation interesting and useful…. Not an easy task after a long work day, a full meal, and at 7:30 in the evening! I believe that you helped energize our team and reminded them about what is important, what is expected by customers, and how to make a stronger and more positive impression with our customers. We all had a fun time, and I enjoyed working with you. Thanks again. Thank you so much for the days! It was a great workshop and I feel very beneficial not only for the Management Trainees, but also for me. I would definitely like to continue with this program in the future. I will keep in touch as we move forward with future groups. Arnold, thank YOU for two great presentations. Overall, the team was very pleased with the day. You were very well received by all. I will pass on my recommendations to the event planning team, and hopefully we can one day work together again. Arnold, You were a great speaker and all the buzz has been very positive. Thanks for being so flexible on the schedule. I have forwarded your email to everyone in the company. If you ever need a reference, please don’t hesitate to use me. Arnold scored high marks. He was here for his 3rd visit. His topic this month was presenting with confidence and he tailored it so that Team Members were speaking about the company. It was a small session, but participants seemed to get a lot out of it. Highly recommend him. Your presentation in September at our annual conference was extremely well received. You obviously made the effort to learn about our industry during your preparation and then took the time to tailor your remarks to our organization – something that far too few speakers bother to do. The results of your efforts were greatly appreciated by everyone who attended your seminar. You provided a tremendous ‘bang-for-the-buck’ both in content and in setting an exciting and energetic tone for the remainder of our conference. Thank you! At one point we seemed to have lost our focus, and then we turned that bleak situation into one of the most positive work sessions I have seen at CANUSA in a long time. I applaud our facilitator, Arnold Sanow. Arnold , Thank you so much! The team has incorporated your advice into their intros & presentations; we all learned a lot… it was a very productive day! THANK YOU! You absolutely won over the management team and the staff. Equally important – – your emails and advice are being shared throughout the organization. Can’t wait for you to come back. Julia Clark Day, VP of Marketing, Leisure Trends, Inc. Thank you! 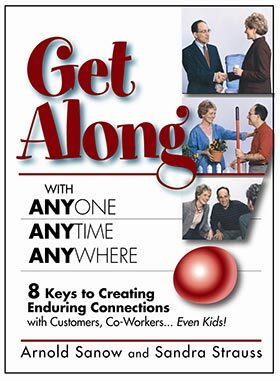 I received only positive feedback regarding “Get Along Better with Anyone, Anytime, Anywhere…” Everyone loved it! I will absolutely keep you in mind for future professional development/employee engagement events. Thanks again. I have been receiving really good feedback regarding the team building session on Friday. Thanks again for joining us in such an informal setting. I will definitely keep you in mind for future sessions and will also give your information to our senior leadership team – they really need your training! Thanks! Thank you for your email and the pleasure was all ours! Always fun to listen to you – you always bring a humble but knowledgeable attitude to training this class and by keeping it flowing and changing topics, you keep it fresh and entertaining. As a (part-time) presenter and facilitator when needed, I know that’s not easy! Appreciate you sharing the link to your book. I will send that out to everyone. And of course, we will keep you in mind for future training. Thanks for the support. It was great to have the brainstorming session with the supervisors. I think we came up with some great ideas to implement. The team had many positive things to say about the training. I appreciate all your help. Your presentation today was absolutely what our team needed and wanted to experience. I’ve heard nothing but positive comments. Thank you so much for a wonderful day! Thanks again and I’m in hopes that we’ll see and hear more from you. Arnold, I have to tell you that it is rare for staff to seek me out and thank me for sending them to training, even when they requested it. But after last weeks classes, numerous folks have gone out of their way to tell me how much they enjoyed your training sessions and then actually thanked me for setting it up. So I wanted to pass those ‘thanks’ on to you. You made it easy for our folks to feel comfortable about getting up and making a presentation in front of their co-workers. This will not only help them in the professional careers, but it also helped their self- confidence, and they realize it. I thought you would enjoy knowing that your influence on this office will continue. Your presentation was perfect, and right on the money!! Thanks for working with us. Maybe we will have a chance to work together again. Thank you so much for presenting for us on our annual Staff Day. You have received phenomenal reviews and most employees have rated this year’s Staff Day the best yet. I really appreciate all of your time and flexibility. Thank you so much! Your talk was great! I know everyone I talked to loved your talk and really appreciated it! I will let you know if they want you to expand on it! Arnold, Thank you so much! Both Charlie and Jim Kelley have incorporated your advice into their intros… we all learned a lot.. it was a very productive day! THANK YOU! You absolutely won over the management team and many of the staff members at Corporate already know your name. Equally important – your emails are being shared throughout the organization. You are JUST GOOD! Arnold knows how to empower individuals and deliver a session on leadership and people development that is inspiring. He challenges professionals to consider every employee engagement as a strategy to increase morale and productivity. Arnold reminds the audience communication is an art and great leaders are on a constant pathway of self-discovery. Well received session. Arnold. Your presentation was very well received. Your material is timely and your delivery is great in that it involves the audience – you really had them tuned in! Thank you for being with us, and please let me know if I can ever provide a recommendation for you to any other groups. Thanks for a great job! You were on the mark and your efforts to tie your subject to our business enabled our people to get more out of the presentation. The response from the group was an overwhelming “yes” to your program. Let’s discuss on-going sessions. Arnold was great. We have had very positive feedback from everyone. He made some very important points in a relaxed and humorous way…I think people were listening more than if he Arnold had done what he calls “death by PowerPoint.” And he avoided any “group hugs”. Seriously, Arnold’s presentation was really very well done. We are considering some additional meetings for our 13-14 managers and supervisors in OPACE in late January or February and want Arnold back. This is just a quick note to thank you for another great presentation. All of the feedback we have received was very positive. While our program is in the business of communicating, it doesn’t necessarily mean we are perfect at it ourselves. You gave us a nice foundation for us to work from in building a more effective group of managers and supervisors. There was a lot of very helpful information that was presented in a way that people engaged in and got a lot out of. Everyone was pretty energized by what you said and how you said it. As often as I told you I wanted FUN…I have to tell you over and over that you were terrific. I was still high on watching you PERFORM…and how it all worked out. I haven’t talked with Lisa yet, but intend to tomorrow and I will certainly get you in to speak with my other Director. Many thanks for being such a pleasure to work with, we were a great Team! I truly enjoyed your presentation at the BAI Summit. I have to admit I was a little skeptical before entering the session, but you kept my interest with your high energy and subject knowledge. I also reviewed your “Get Along” video on you tube and have sent the link to my associates. Arnie was fabulous. As I thought, everyone fell in love with him. He made our meeting! I will have testimonials coming for your file and Arnie’s. I also asked him to hold our convention dates on his calendar … we must use him again! Thanks for your help in bringing Arnie to us. Kelly Blackstock, Meeting Planner, Precision Tune Auto Care ——– Your presentation was very entertaining and timely. You hit all the high points in regards to building sales and customer retention. We also appreciate all the “extras” prior to and after the event. We look forward to working with you again in the future. Arnold, thank you again for serving as our presenter at this year’s annual conference. As with last year, you delivered another great presentation!! Arnold, thanks so much. Guys like you make guys like me look good. I will spread the Arnold Sanow word! You did a great job. In the past 20 years, I have attended dozens of seminars such as this. I would give you a superior rating. 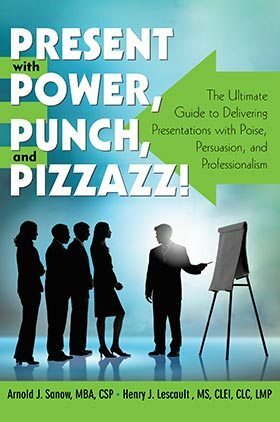 Your style of delivery has a very commanding style, not in a threatening manner, but you command attention throughout because no one wants to miss hearing anything you say. In the back of the room, I had the opportunity to watch participants and I did not see any of them visiting throughout your presentation. You had their undivided attention throughout. Arnold, Thank you for the session you held with my team yesterday. It was very well received and I think really helped to put in perspective our meeting today. My team is in a pretty challenging time, and it was apparent they took away a new appreciation for each other’s styles and perspectives. Again, thank you and I will recommend the session to others in the agency as well. Just wanted to say it was a pleasure meeting you and I’m enjoying your Get along book. I’m always looking to better myself and my Relationship in all areas of life and your book and your advice is also helping me with that. I just wanted to say that was a great communication skills program that you held in the room last Friday. You really gave a lot of key things to look out for and to avoid when dealing with people. Sometimes it’s hard dealing with people on a day to day basis but now since I have a chance to listen to you and hear your advice it makes dealing with people in any aspect a lot easier. I just wanted to say thanks and It was a honor to work and sit in on your communication training. I have been in one of your meetings with UMA and I loved it then. This one in Savannah was really awesome and I have read 1/2 of the book already and love the Charisma Cards. Thanks for being at GMOA. Thank you Arnold. Employees here are still talking about your visit here. I also heard many compliments for you after the Sunrise Seminar. In fact, several commented on how your session was much improved over past Sunrise events. Arnold Sanow is one of the instructors in the Leadership Skills for New Supervisors course. He teaches a full day on Presentation Skills and he is wonderful. Within minutes, he has a classroom full of very nervous students completely at ease, laughing and engaged in learning. The day continues in that vein, and students tell me how much they enjoyed the class and how much they learned from him–in spite of their initial nervousness. As you can see by the evaluations from the High Impact Communication sessions the troops were very satisfied and they gained some valuable insight into the communication process. Kudos to Arnold for a job well done and we also appreciate the follow-up you provided. Thanks again for the professionalism and wonderful delivery. Arnold I received an overwhelming number of positive feedback comments from our staff. For such a tough group, this is great! I especially appreciate the way you adjusted the training to meet the expectations and needs of our group. Overall, the training had a positive and energetic atmosphere that encouraged good interaction among the participants. We are certainly interested in other programs you offer. Thanks for a great training session. Thanks Arnold!!! Even though I attended your class 3 times, I was never bored and I feel that I learned something during every session. I’ll be in contact if I need anything else or feel that you could assist in some way. I’m already praising you and this class every chance I get! So hopefully, you get more business from the OCC. Based on all the feedback received from Nancy and me, you were able to pull off a miracle and get people not only too laugh but to get and remember numerous key points. This was not easy due to a very tough situation brought on earlier in the day. Maureen and Chris said you were outstanding in helping people process through the myriad of feelings being experienced. Thank you for your presentation yesterday. People were actually talking about it over breakfast this morning! I will certainly keep you in mind for future opportunities at APCO. I would love to have you back. Once again, you were absolutely terrific and really sparked conversation and analysis among my staff. We are already developing a corporate newsletter that will go out monthly. That was one idea that really “stuck.” I will probe and see what else they heard from you. I didn’t join you because my “D” tendencies are to dominate the conversation. So once again, thank you. Your knowledge and warmth came through not only in front of the group but in the smaller session and one-to-one. As chair of the Marin County Realtors Association, I take an inordinate and completely underserved amount of credit for booking you for out summit. Truth be told there was no contest. You were, and are, a hit with us. Thank you so much for an uplifting and worthwhile presentation. I look forward to your next one! I have been attending BTA seminars for years and this was the best one I’ve been to. It was realistic, not just theory. Hire this guy again, he’s excellent. I want to thank you again for the wonderful seminar you presented to us at Florida Independent School Business Officers Association. You were very entertaining (kind of a cross between Woody Allen and Jerry Seinfeld) as well as informative. And your message is one that we all can use to improve ourselves. It was the most enjoyable class I have ever attended! Don Campfield, Business Mgr./HR, Holy Trinity Episcopal Academy, Inc. Thank you for the wonderful job you did at the Glass Management Institute. I have attached your evaluation results and as usual you received high marks! Here’s what some of the comments were: “Very fun and keeps you involved”, “Great seminar, very interactive”, “I really enjoyed Arnold. He is one of the best speakers I have ever heard and that list includes: George Bush, Lou Holtz, Colin Powell. Excellent seminar”. Based on comments and a review of the overall conference evaluations, it was a success. Arnold was a hit!! His scores are the highest of anyone who spoke at the conference. It was a pleasure working with you Arnold. As you could see from the evaluations, the feedback from participants was very positive. I’ll keep you in mind as we plan our next training programs. I am sending you this e-mail to inform you that Arnold Sanow is a GREAT! Speaker. He is very knowledgeable and has a wonderful sense of humor. I know the employees really enjoyed his session. Hands down, the best seminar packing the most bang for the buck was the one that Arnold Sanow delivered for the Outdoor Industries Summer Summit for retailers. Arnold spoke at the last OIA meeting and we were impressed. His very funny and very New York-esque in-your face workshop made him a double thumbs up presenter and facilitator. We enjoyed having your speak at our conference. It was a breath of fresh air for all who participated. Informative and entertaining. I have attached the evaluations from Cape Cod– excellent work! I picked up Julie last night at the airport and she said your presentations went very well on the cruise. I am in the process of putting together next year’s schedule and wanted to see if you were interested in speaking for us next year. Judging from the comments your presentation was very well received. Staff who normally do not offer comments about such things have been very positive and appreciative of having you come to speak to them. I personally was very confident that you would deliver just the right combination of humor and message to keep them ngaged, which you did very effectively. Hands down, I will tell you that your seminar was one of the best I have ever attended. Maybe even the best! Thank you so much for your outstanding presentation. Your presentation was interactive and lively. It was a perfect blend of humor and content … everything we asked for! Our audience appreciated your excellent handouts. Most of all, you were wonderful to work with and we truly enjoyed meeting you! Arnold Sanow is the Commandant General of the Boot Camp for Entrepreneurs. Your presentation was thoughtful and well-organized, and the time you took to learn about our industry showed in the results. You gave our participants value and made us look good, so I’m adding my high marks to the groups! Your “Managing Chaos” seminar was excellent. The feedback has been great from your session. The ideas you presented were not only useful but easy to put to use immediately and in the future. The whole day was very motivating. David Durham, Sr. Vice President & Group Publisher, Phillips Business Information, Inc. I thoroughly enjoyed your presentation and have already put into practice several of the skills and behaviors you suggested. Arnold, a 100% success! The staff were informed, entertained and energized. I cannot thank you enough. I am also preparing a summary of the day and want to add those personality traits that you discussed. That went over particularly well with the direct service staff. Everyone is talking in terms of “promoter,” “thinker,” “accomodator,” etc… The fairly skeptical corporate staff are now completely energized to get going! Barbara Marcus, President, Parents in a Pinch, Inc.
Hi Arnold, I just wanted to write a quick note to tell you how incredible the “fallout” from our meeting has been. We had 3 brainstorming sessions and the results have amazed me. I really didn’t know that we could do things so much better. Much is in the planning, but the atmosphere around here is electric. Wow. Everyone I spoke with afterwards had nothing but praise. They all will be returning to their homes with a renewed commitment to our goals and better equipped to carry them out thanks to you. And by far your session was singled out as their favorite. Got some sizzling new ideas! Arnold held interest the entire day. As you know, folks in the HRD field are some of the worst critics, yet the evaluations raved about the work you did. We really appreciate your providing such a thought-provoking and useful presentation. The participants’ feedback was very positive. In fact, you received a rating of 4.7 out of 5.0. Your presentation had the right mix of “how to” information and participants’ involvement. Everything you did from the need analysis to the workbook you prepared to the actual presentation made the seminar one to remember. I look forward to working with you in the future. Mr. Sanow is an excellent presenter, he entertains as well as informs. Thank you for the inspiring seminar. You have really shown us how to open the doors to many marketing opportunities in the greater Kansas City area. I thought I’d try to sneak out early, but the content and Mr. Sanow were so interesting, I stayed the entire time. Very worthwhile, very practical with “hands on” ideas. Loaded with ideas. Your sessions in Dallas were so well received, we would like to have you back next year. I want to thank you for the excellent training program you conducted for Health Management Associates. Based on the way everyone is behaving this week, it was a resounding success. We will be in touch soon to discuss some follow-up activities. Therese Kleinkauf, Health Management Associates, Inc. Thank you for speaking at our meeting in Williamsburg. As you can see from the attached evaluations, the seminar was very well received. Thank you for speaking at the NSSEA meeting. As you can see by the evaluations your sessions were excellent. Here are some of the comments. “Excellent presentation – was full of impact”, “Wish it was longer .. that is rare for me”, “Very energetic, enjoyable and entertaining”, “Excellent information and execution”, “Best speaker at the conference”, “Good pace, good content, and good audience interaction”. Throughout our association you were professional, flexible, able, and eager to meet our needs. Having gone through the training myself, I am aware of how beneficial your training was in improving the performance and the skills of our staff. I would like to thank you not only for an inspiring seminar but also for a very useful book which I have already begun to use. On behalf of Delphi, the U.S. Information Agency, and our distinguished international visitors, we want to thank you for your presentation. As always, the seminar was excellent! The visitors especially enjoyed the participatory nature of the day and all felt they gained valuable information. Thank you for your great presentation to the guests of the Harvard OPM reunion. Everyone really enjoyed it. I wish we had allowed more time for the presentation – it seemed to go so fast. Your seminar on “Successful Entrepreneurship” was one of the most stimulating and revealing during my entire three and a half month stay in the USA. I have forwarded your name to some of the organizations who could benefit from your wisdom and expertise. Thank you for the wonderful seminar you put on yesterday for the Wedding Pages. I have already started implementing many of your ideas. I’m also sending your promotional material to a friend of mine who works at Careertrack. You would be a great addition for them. Arnold, my first thank you note is to you. You made the seminar the success that it was. I received several phone calls from people who attended. Their comments were very positive and encouraging and we definitely want you back. Thank you for doing such a fantastic job for us on Saturday. The Community Associations Institute would not have been more pleased with your speech. We enjoyed working with you and look forward to bringing you more business in the future. Thanks so much for making the seminar held in St. Louis, MO enjoyable and informative! Your seminar in marketing was packed with effective strategies and sound, proven ideas. I enjoyed meeting you at the Peanut Growers Association seminar in Weldon yesterday, and found your presentation to be extremely informative and pertinent to the business of the Virginia diner. Please send me information on other seminars you give. I usually have a two hour limit for sitting through anything at all, and was pleasantly amazed to find myself not only still there at the very end, but actually the last person out the door! It’s a first, believe me.